This page is dedicated to people learning guitar and want to learn basic guitar chords which are easy to play. Once you have mastered these chords, you can move on to learning more advanced chords. Always start with 'open chords' which simply means guitar chords played in an open position, therefore no barre chords. The reason for that is that barre chords are built around open chord positions. Once you have a solid grounding of open chords, barre chords are a 'walk in the park'. P.S. Also available is a similar page dedicated to left-handed guitarists. Firstly, when learning guitar chords, there are a few things to learn when reading the following charts. Each finger on your left hand or right hand has a number. The next thing we need to look at is the guitar fretboard, which includes the nut, the frets and the strings. Notice that the strings are all a different thickness. Top E is the thinnest string with the highest tone, while bottom E is the thickest string with the lowest tone. Please note that we use the term 'fretboard' as opposed to 'fingerboard' because of the presence of frets. Stringed instruments that don't have frets use the term 'fingerboard', i.e. fretless bass, double bass, cello, violin, etc. Although you won't be playing any barre chords in this session, I have included a barre line in the diagram, so that you are familiar with it for later sessions. In the following diagram, the first finger uses a barre to cover the first 5 strings on the first fret. 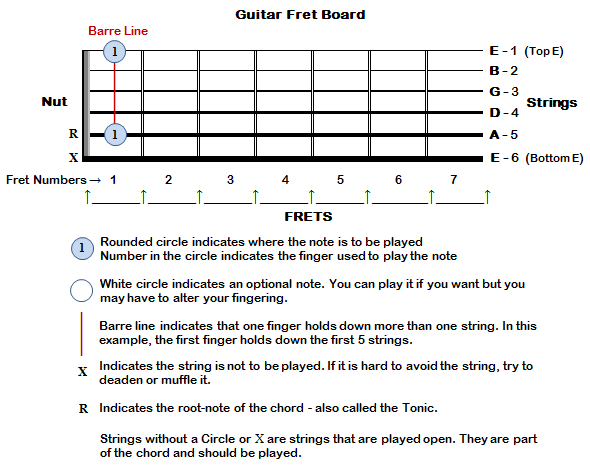 Frets are the metal strips (fret wires) that are set into the entire length of the fretboard at right angles to the strings. When you press a string down on a fret, you are shortening it. The length of the string is one of the factors that determine the pitch of the note. Please note: When you are asked to play a note on a particular fret, you actually press the string in the space behind the fret, not on the actual fret, as this causes the note to sound muffled. You can see this clearly on the diagram above... notes played on the first fret are on the 1st space after the nut; notes played on the second fret are on the second space after the nut; notes played on the third fret are on the third space after the nut, etc. These positions are all depicted by the fret numbers and finger positions which you will find on all the chord charts.. The shorter the string, the higher the note. The longer the string, the lower the note. As you move up each fret, you are moving up one semitone higher than the fret below it. So, if you play the open E string (1st string) and then hold down the first fret, you are playing an F. If you then hold down the second fret, you play an F# and so on. The 12th fret is located halfway between the nut and the saddle. The saddle is situated on the guitar body where the strings end, and is usually made of bone, ivory, plastic, or other synthetic material depending on the quality of the guitar. 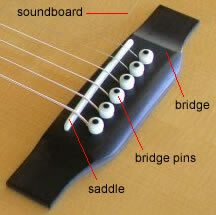 The saddle sits in a groove on the bridge and has 6 or 12 notches depending on the number of strings your guitar has. These notches prevent the strings from moving around, especially if you are playing fairly hard. The vibration of each string begins at the saddle and ends at the nut. The vibration from the strings are also transmitted through the bridge to the soundboard. The saddle can affect many important aspects relating to the sound of the guitar including the tone, volume, and tuning, with the natural materials (bone or ivory) resulting in better vibration transfer and greater volume levels. The 12th fret divides the vibrating string in half which means that the note on the 12th fret has the same pitch as the open string, but is one octave higher. Therefore if you hold down the 13th fret on the first string, you are playing an F; hold down the 14th fret, you play F# and so on... the pattern starts all over again, except the notes are one octave higher. Guitars also display Fret Markers or Inlays which come in the form of dots or other shapes depending on the manufacturer. They are inserted into the fretboard along its entire length. You will find them on the 3rd, 5th, 7th, 9th 12th, 15th, 17th, 19th, 21st and 24th frets (if your guitar has a long enough neck). They enable you to move around the fretboard quickly and easily and know exactly where you are at any given time. As you learn more, you will understand the importance of these, especially if you are playing barre chords or play lead guitar. So what open chords should you learn first? If you are a beginner, the easiest open chords are the best place to start. We are going to play chords in the first position which are the chords that are usually located on the first 3 frets. When you see an 'X' next to a string, it means you don't play that string. If you do, it will give the chord a 'discordant' sound which is not very pleasing to the ear. Don't worry about that too much because the more you play and the more confident you become, the less the tendency will be to play these notes. Unlike most guitar chords where the guitar neck is viewed vertically, I have displayed the chords in a horizontal position so that you view them in a natural playing position i.e. looking down at the fingerboard while you are playing. I refer to this view of the photo as the chord chart view... the chord charts are displayed in exactly the same way. The chord in this picture is a B7 chord. This chord is probably one of the hardest basic guitar chords you will learn, but with practice it becomes very easy to play. Try to remember the shapes of the chords, so that you have a mental picture of where your fingers need to go before you actually play the chord. There are several ways to play the following chords, but we will be looking at the easiest and most common ways to play them. The E chord is the easiest of all the basic guitar chords, as you can strum all 6 strings and it will always sound great. Also, by taking off one finger, you can play an E7 or Em chord. The C chord requires a little more precision to make the notes sound clearly. This is also true for the B7 chord, but the more you practice, the easier it gets. The F major chord requires you to use your first finger to play 2 strings at once. This is a small or simple barre. It seems hard at first, but make sure your thumb supports your first finger by providing pressure directly behind the barre on the back of the guitar neck. The G chord can be played using fingers 2, 3, and 4. Finger 1 becomes finger 2, finger 2 becomes 3, and finger 3 becomes 4. This is useful if you are playing a G chord followed by a G7 chord or vice versa. From G to G7, you simply take off the 4th finger and add the 1st finger while leaving fingers 2 and 3 unchanged. From G7 to G, you take off the 1st finger and add the 4th finger leaving fingers 2 and 3 unchanged. 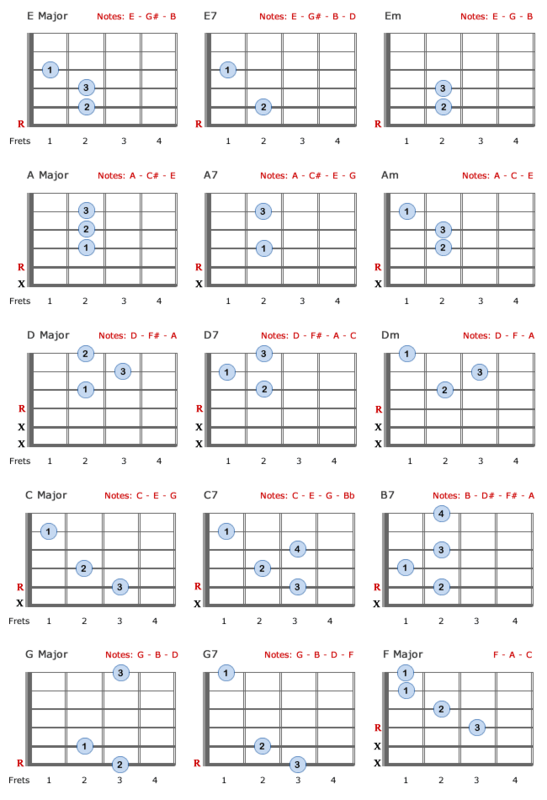 Make sure you practice these basic guitar chords until they sound smooth and clear. You must hear every string ring clearly with no muffled sounds. Once you achieve this, you are ready to move on. You can go to the Guitar Chords section for more open chords or you may want to get started on barre chords or even power chords. If you are a beginner, make sure you learn the basic chords first. They are the easiest and most important chords to start with, giving you a solid foundation before moving to the next level. Many artists have recorded this song with many versions available. We have used a simple version which is suitable for beginners. For Janis Joplin Fans, we have dedicated a page to her version of Me & Bobby McGee. 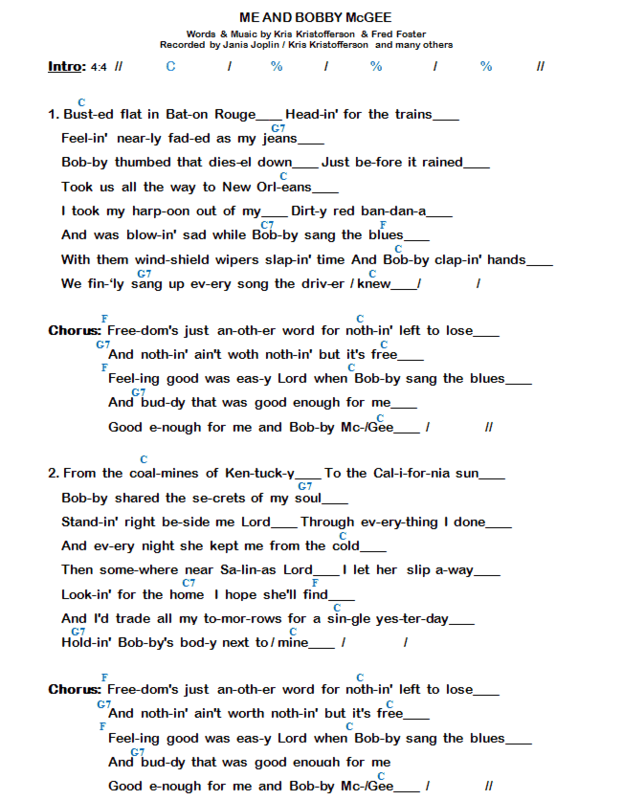 You will find information, a video of her version along with chords and lyrics to the song. Just turn on the video and play along. Just when you thought it was safe, I have added alternatives to C major and F major. With this C major, you can play all 6 strings and with F major you can play 5. It means you have less room for error, especially if you are prone to hitting the wrong strings. It is exactly the same as your normal C and F chord except that you are adding a note. In both examples, you just move your third finger up one string and add your fourth finger to where your third finger was. It's a little awkward at first, but the more you practice, the easier it becomes. Remember that this is not vital, but it is good to know because as you continue playing you will find yourself using these chords more and more. The C Major above is sometimes written as C/G which means a C Major chord leading with a G bass note. The F Major above is sometimes written as F/C, an F Major chord leading with a C bass-note... commonly used in country music with alternating bass notes. Different ways of playing the same chord are also referred to as voicings. As you learn more and more chords and introduce barre chords, you will find several ways of playing a particular chord. This is very useful depending on where you are on the fretboard and the type of sound or mood you are after. If you are really serious about a good solid foundation in guitar incorporating excellent guitar technique, you may want to consider studying classical guitar... even for a short time. Your hand, finger, and playing technique will improve tenfold, especially if you love fingerpicking. You don't have to become a classical guitarist, but you will certainly be glad you went through the exercise. If you do decide to learn classical guitar, ask your teacher about Aaron Shearer Classic Guitar Technique, Vol 1 (Book & CD). It has been around forever and there's a reason for that. When I studied classical guitar, this book was a pre-requisite... I couldn't put it down. It weaves you from lesson to lesson with excellent instruction and useful exercises which become a little more challenging with every lesson. Whether you are playing guitar, piano, or any instrument, classical training at the onset can be extremely beneficial. It gives you good grounding, correct 'playing technique', and improves your reading and understanding of music notation. It helps to iron out incorrect 'habits' from the very beginning, paving the way forward in your musical development. For the very young, usually less than 8 - 12 years of age, a full size guitar may prove very difficult due to small hands trying to span wide frets. Also, a steel string guitar can prove very uncomfortable for young hands. If you or your child are young with a small hand size, you may want to consider 3/4 guitars with nylon strings. The frets are easier to reach as they are narrower, and the nylon strings are a lot easier on the fingers, making playing more enjoyable... something to think about. When you start playing guitar, your fingers will become very tender and 'hurt like crazy', but it does get better. After a few weeks or months depending on how often you play, you will start developing callouses or thicker skin on your fingertips. When this happens, playing will be a breeze. If you get the chance, go to your nearest guitar store and get a 'feel' for all the different types of guitars - hold them, play them, try the 3/4 guitars if you are a youngster, and most importantly, choose a 'comfortable fit'. We hope you have enjoyed this session on Guitar Chords for beginners. If you have any questions or would like to offer any suggestions, we would love to hear from you.